'Shall We Dance' runs Friday–Sunday through Aug. 19. Jack London State Historic Park. 2400 London Ranch Road, Glen Ellen. Doors open for picnicking at 5pm; show starts at 7:30pm. Tickets $45–$150. 877.424.1414. transcendencetheatre.org. MOVE YOUR FEET Broadway Under the Stars' new show puts the spotlight on dancing. 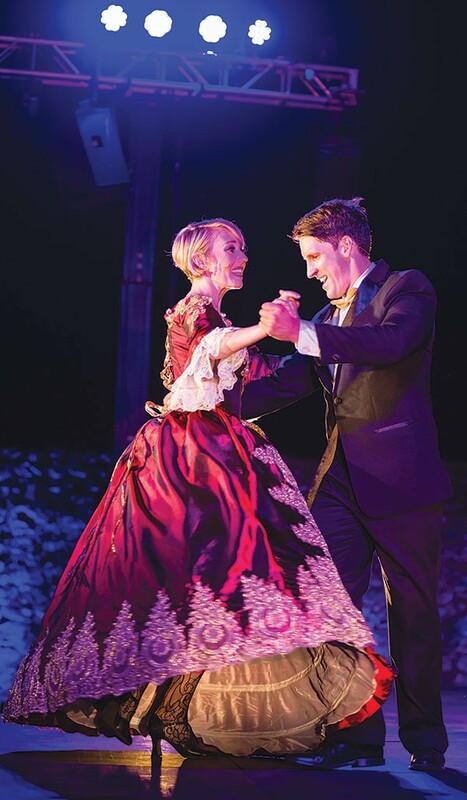 Transcendence Theatre Company's seventh season of Broadway Under the Stars continues with a dance-centric production titled, appropriately enough, Shall We Dance. The show runs through Aug. 19 at Jack London State Historic Park in Glen Ellen. Transcendence imports Broadway and national touring professionals to populate its productions, so the caliber of performance is always quite high. Director Leslie McDonel and choreographer Marc Kimelman guide a cast of 17 talented artists through a program featuring songs from 18 Broadway shows like The King and I and Hamilton, as well as pop hits from artists like Madonna and Ed Sheeran. The show opens, as is tradition, with a passage from Jack London as introduced by a coterie of tap dancers. The full company then welcomes the audience with an amusing adaptation of "Be Our Guest" from Beauty and the Beast that replaces banquet table staples with wine varietals, though I'm not quite sure what dancing strawberries are doing on the stage. The (mostly) fast-paced, 40-minute first act includes numbers from In the Heights, West Side Story, My Fair Lady and Kiss Me, Kate. The highlight of the act is an energetic production of Louis Prima's "Sing, Sing, Sing" which incorporates a variety of dance styles that complement its swing roots. Things slow down with "Mama Who Bore Me" from Spring Awakening, which seems tonally out of step in a mostly joyous program, before concluding on a lighter note with the hilarious "A Musical" from Something Rotten. Act two features dancing set to numbers from a diverse group of artists ranging from Janelle Monáe ("Tightrope") to Madonna ("Vogue"). The evening's most visually striking moment comes courtesy of a tango-infused production of the Police's "Roxanne" from Moulin Rouge with the winery ruins bathed in red. The juxtaposition between the diversity in dance styles and music selection with the lack of diversity among the cast is noticeable. For a company that imports a great deal of its talent from New York, the relatively small number of artists of color in the cast is disappointing. Simply put, it's jarring to have Coolio's "Gangsta's Paradise" and Michael Jackson's "Bad" sung and danced by a bunch of white guys, talented as they may be. It's time for Transcendence's cast to be as colorful as the costumes they wear.